Much of Whitney’s recent work is inspired by diverse art forms found within pow wow dancing. The making of an pow wow outfit is a labor of love, often taking many days or months to create. The regalia itself contains many embedded values and meanings. The headdress, with its many feathers, shows that the wearer is an accomplished person. They are sometimes gifted to people of great leadership, embodying empathy for fellow tribal members. The wearer literally feels the weight of their community. Dancing is also a great responsibility. Eagle feathers are worn by both male and female dancers, given to individuals to commemorate significant life accomplishments. 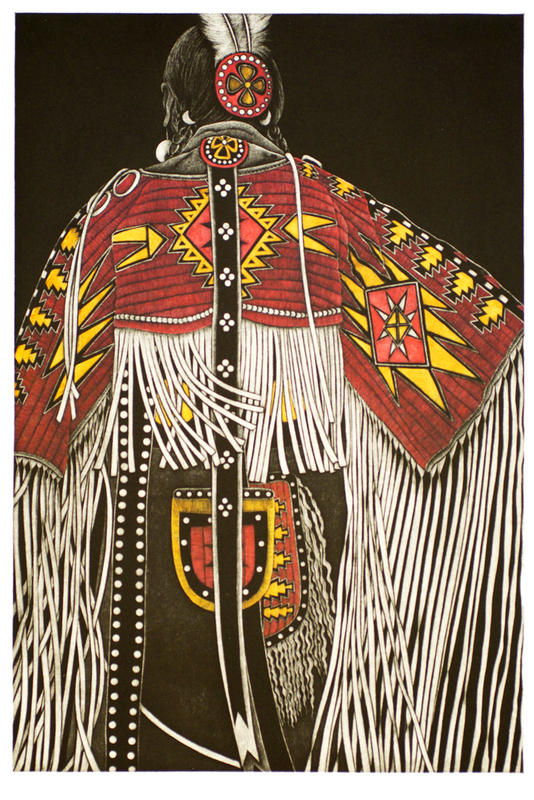 Pow wow outfits, especially those that are beaded or quilled, take tremendous effort and skill to create. Whitney, like the pow wow dress makers, has an intense work ethic and mastery of her art. She uses the impossibly slow, tedious, and physical mezzotint process, to create a stunning and impressive body of work. Her skill in mezzotint has earned Whitney frequent awards and inclusion in prestigious international exhibitions. Whitney had a 20+ year teaching position at Valley City State University, retiring several years ago to focus entirely on her work. A homemade lunch will be provided for $5 or bring your own. Please RSVP by June 5 to 701-251-2496. The body of work included in Regalia pays homage and respect to the vibrant, complex, alive and contemporary Native people. Over the years, The Arts Center has shown Whitney’s work many times and each time it surpasses that which proceeded it. Her work is always complex, having extraordinary detail, meant to be enjoyed and savored. Interestingly, while a pow wow is about movement, and activity, these prints are quiet and encourage contemplation especially for the accomplishment of an extraordinary artist.